An Italian import (broccoli means "cabbage sprout" in Italian), this now-popular green vegetable was not grown commercially in the U.S. until the early 1920’s. A member of the cabbage family, fresh bunches are available year-round with peak crops harvested between October and April. This versatile vegetable can stand alone as a substantial side dish, though broccoli recipes include hearty main dish casseroles, as well as stir-fries, salads and pasta dishes. Raw broccoli is also a terrific crudité with queso dips and cheesy fondues. 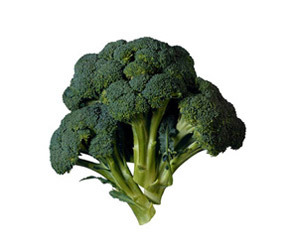 Select broccoli with firm stems, crisp leaves and tightly closed dark green or purplish-green buds. Bunches with yellow or open buds and woody stems are no longer fresh. Refrigerate unwashed broccoli in a plastic bag for up to 5 days. After rinsing under cold water, remove and discard the leaves and ends of the stems. To make broccoli spears, use a vegetable peeler to remove the tough, outer part of the stems. Cut the stems and florets lengthwise into halves or quarters. Cut slits in the stems to help them cook more quickly and evenly. To separate the florets from the stems, lay the bunch of broccoli on its side. Use a large knife to cut off the florets, leaving about 1/2 inch of small stems attached. Large florets can be broken or cut into bite-sized clusters. Florets may be cooked or served raw. Peeled broccoli stems may be cut crosswise into 1/4-inch slices; eat raw or cooked. Broccoli should be steamed, boiled or stir-fried until just tender. Overcooking robs this vegetable of its vibrant green color and fresh taste, giving it a drab look, mushy texture and strong flavor. Florets cook more quickly than stems, so cook them separately to avoid overcooking. Watch our video on How to Cook Broccoli for more information. Blanching or partially cooking broccoli florets for salads makes them slightly tender and retains their bright green color. Cook the florets in boiling water for 2 to 3 minutes, then immediately plunge them into ice water until cool. Drain and pat dry. Add florets and sliced stems to your favorite stir-fry recipes and serve over hot cooked rice. Top baked potatoes with cooked broccoli and KRAFT Shredded Cheddar or Swiss Cheese for a meatless main dish. Get the kids to eat some green veggies by stirring chopped cooked broccoli into prepared KRAFT Macaroni & Cheese Dinner. Serve raw florets or peeled and sliced stems with your favorite KRAFT Dressing as a dip. Dress up plain, steamed broccoli spears by sprinkling them with KRAFT 100% Grated Parmesan Cheese or toasted PLANTERS Silvered Almonds.